Edgetech Instruments Inc. Moisture Analyzers Assist Innovative Liquid Metal Battery Maker Ambri Inc.
Edgetech Instruments provides Ambri, a manufacturer of innovative liquid metal batteries located in Marlborough MA, with the PPM 1 Trace Moisture Analyzer from their facility in neighboring Hudson, MA. The PPM 1 sensor utilizes a proprietary P205 (phosphorous pentoxide) technology to provide accurate, long term trace moisture measurement at low Parts Per Million by Volume (PPMv) moisture levels. The PPM 1 is used to monitor various inert blanketing gases during the manufacturing of Ambri’s liquid metal batteries, as even small amounts of moisture can have an adverse effect on the results and performance. Ambri Inc. is developing an electricity storage solution that will change the way electric grids are operated worldwide. Ambri will enable the more widespread use of renewable generation like wind and solar, reduce power prices and increase system reliability. Ambri’s technology - the liquid metal battery - was invented in the lab of Dr. Donald Sadoway, a professor at the Massachusetts Institute of Technology. At MIT, the Liquid Metal Battery Project built upon Professor Sadoway’s 40 years of experience working with extreme electrochemical processes, ranging from aluminum smelting, to molten oxide electrolysis for extracting oxygen from lunar regolith, to lithium polymer batteries. 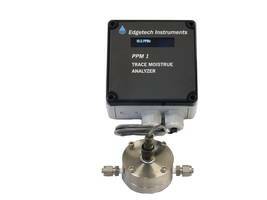 Humidity Analyzer monitors moisture in gases.